Mini Moderns P.L.U.T.O. wallpaper is featured in the October edition of Elle Decoration (UK) magazine, in the striking washed denim and copper colourway. As you may already know, the print is named after the Pipe Line Under The Ocean – a WW2 fuel line built under the English Channel from Dungeness to the French coast to supply fuel to the allied D-Day invasion army. The pipeline is represented by a continuous metallic copper line, running diagonally across a background inspired by ‘dazzle’ camouflage featured on military vessels during the two world wars. The design also features circular and curved motifs based on the three Dungeness ‘Sound Mirrors’. 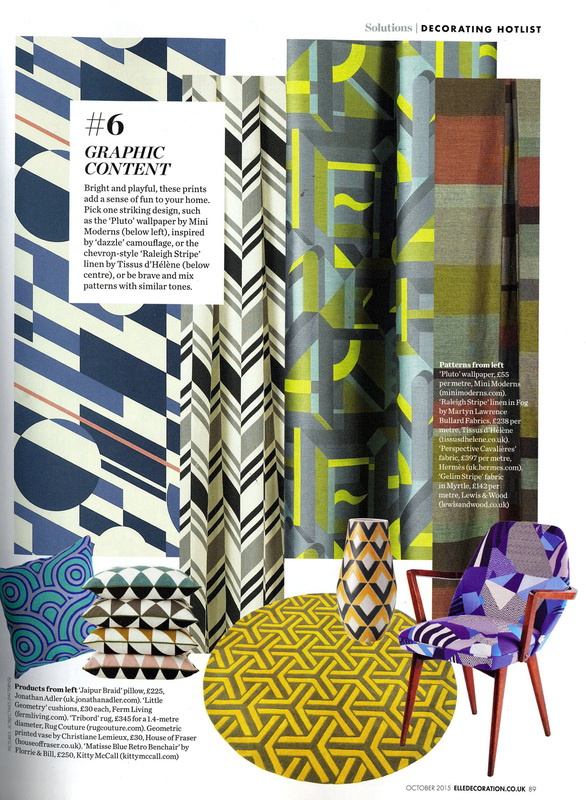 We are in amazing company, with the likes of Hermès and Dwell Studios’ founder, Christiane Lemieux. And by the way it retails at £55 per 10 metre roll, not as it says £55 per metre – which would make it rather pricey to cover your room with. 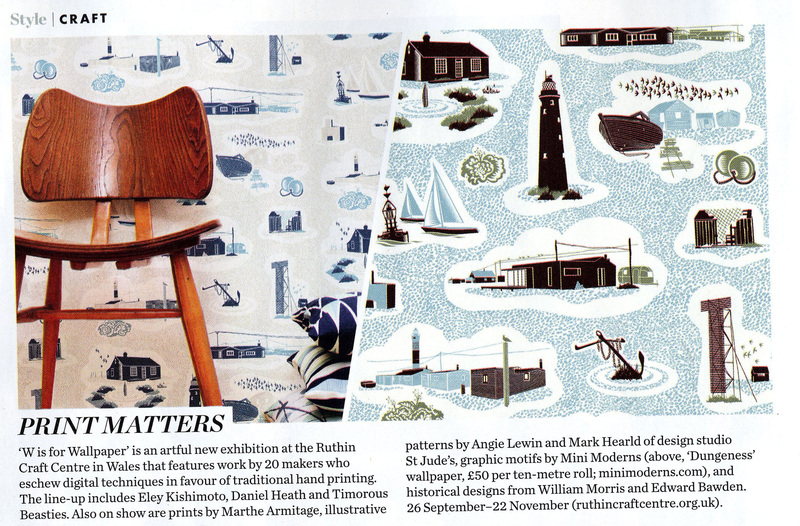 In the same issue – our Dungeness wallpaper features as the lead image for a very exciting exhibition, called ‘W is for Wallpaper’ which runs from 26 September – 22 November at the Ruthin Craft Centre in Wales, which features a number of great contemporary pattern makers – and then us! Stay tuned for an filmed interview we did with the organisers of the exhibition about our inspiration and production methods – we will post it soon once the editing has been done – which I suspect means taking out all the mistakes we made during the shoot.